GoPro have announced their latest slew of camera wizardry that is hoping to turn the fortunes of the company around after it posted losses of £179m for the last three quarters. The foldable Karma drone fits comfortably into a custom made backpack so it can be transported to the beach or up a mountain with ease. While the new GoPro Hero5 is waterproof without needing a case and now features voice control. “The entire system fits into the included backpack that’s so comfortable to wear during any activity, users will forget they’ve got it on.” GoPro said about the foldable tech. The voice activated cam will react to simple commands, say “GoPro, start recording” and the camera will start to shoot without any buttons being pressed. The same goes for stopping filming and a host of other functions. The Hero5 will be fully waterproof up to ten metres without the need for an external housing, although one is available if you wish to take it deeper. It also has built in GPS which would be useful if you are using it with the Karma. The drone features a detachable three-axis stabiliser that can be used for handheld shots or to attach to a vehicle. Normally users would have to buy a seperate device to to achieve this. The quadcopter is flown from a simple two-sided controller which includes a touchscreen display on one and two joysticks on the other. 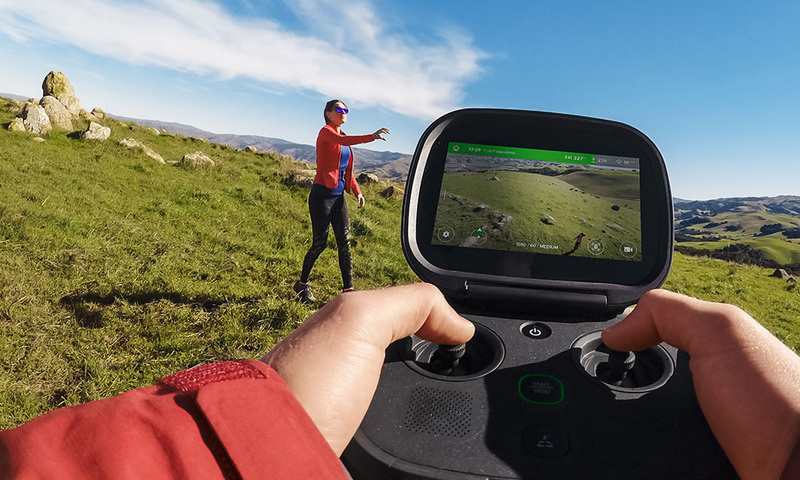 The Karma unusually features a front-mounted camera which is said to eliminate the propellers coming into view when the device is tilted and travelling at full speed. The GoPro Karma will cost £999.99 in the UK with the Hero5 Black, and £719.99 without. It is due for release in Europe on 23 October. This is priced less than their major competitor the DJI Phantom 4 but it is also missing a host of advanced features from the Phantom including collision-avoidance sensors. Neither can it track and follow subjects which some might deem pretty important for extreme sports.